Don Marcos opened last week in the former Whole Enchilada/Socorro’s space a bit west of Haven Avenue, an ambitious startup in a down economy. But the restaurant is said to have been hopping from day one, and on Wednesday evening, cars continually pulled in or out of the parking lot and dozens of diners nearly filled the sprawling restaurant. Depression? What depression? A hostess kept an eye on the parking lot and came out to open the door for anyone entering, a nice touch. There was no wait when we arrived, but the waiting area is inviting and next to a station where the staff makes tortillas. Much as before, the seating area is divided into small rooms of a half-dozen booths. Our room had an aquarium. Our table got arroz con pollo ($12), chile verde ($11) and chicken mole enchiladas ($10). The first dish, chicken and rice, had both relleno and ranchero sauce and was topped with jack cheese. The second dish was chunks of pork with green sauce. The third was two enchiladas topped with mole, a sauce of chocolate with cinnamon. We liked all three dishes, and the corn tortillas were especially good. A margarita was half ice but, at $5.50, deemed reasonably priced. The only real complaint anyone had was about the indie rock music in the background, which brought us the Dave Matthews Band, Gwen Stefani and Fallout Boy. “I’m not here for white guy music,” the Latina in our group groused. There is better Mexican food to be had, at sitdown places like Chalio’s Birrieria in Pomona or Taco Hut a few blocks west of Don Marcos (and far worse Mexican to be had a few blocks east at On the Border). 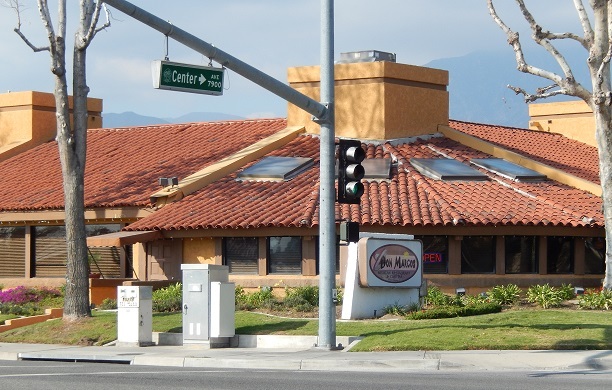 But Don Marcos seems to bridge the gap between homestyle Mexican food and Chevy’s, being comfortable for diners skittish about an authentic ethnic experience while offering what is actually pretty good food. Verdict: A pleasant surprise. But ditch the lame music. 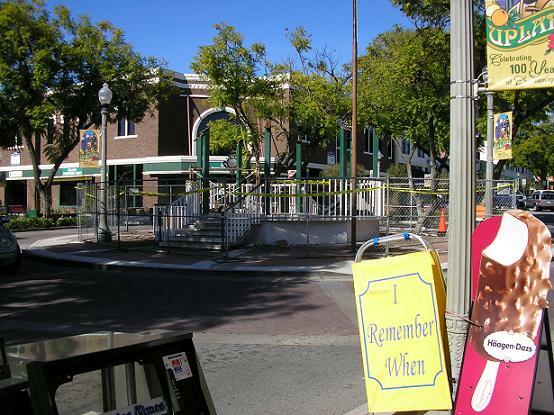 Here’s what’s left of Upland’s gazebo, as a city rehab project has taken the structure down to the frame. There will be more on this in Friday’s column. I saw this scene on Tuesday after lunch at Caffe Allegro, shot the photo and went to City Hall to find out what’s going on. The gazebo went up in 1967 and stands in a roundabout at Ninth Street and Second Avenue, in the heart of downtown. It’s used as a bandstand during the Thursday Night Market, the Lemon Festival and other events. I liked the I Remember When sign in the foreground and included it in the photo. Feel free to remember when by leaving a comment. Museum of Neon Art, L.A. Neon nabobs might enjoy this museum, located in downtown L.A. at 136 W. 4th St. (at Main). 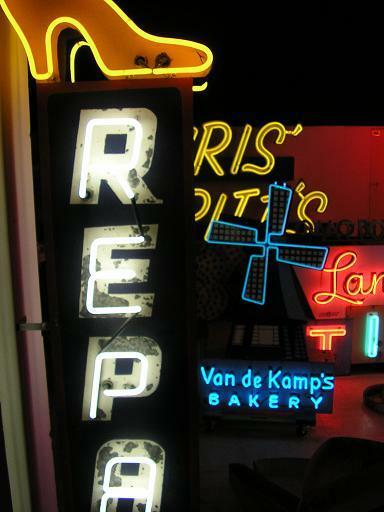 The space has roughly a dozen vintage neon signs, including the ones pictured here, as well as modern art that employs neon. And there are some awesome photos in the lobby. Founded in 1981, the museum has bounced around and is now in its fourth location, and this one isn’t permanent either. But it’s been there since late 2007 and will be there for the forseeable future. I visited the previous location in 2005 after the Midway Building Materials sign in Montclair was donated to the museum, restored and put on display. The sign, formerly at Mission Holt and Ramona, depicts a brickmason wielding a trowel to lay a row of bricks. He appeared to move as the sign blinked. Alas, the Midway man is now in storage because the sign was too large and too heavy to be moved into the new storefront location. But if you think you might like the museum anyway, go for it. I went there Saturday via Metrolink and the Red Line subway; from the Pershing Square stop, it’s about three blocks on foot. If you go, Pete’s Cafe is a half-block to the east and highly recommended for a meal. The newly remodeled Cole’s is two blocks south. Museum executive director Kim Koga was working the desk when I dropped in. She used to live out here, and still visits frequently, so you won’t be condescended to if you tell her you’re from, say, Upland. How many L.A. attractions can you say that about? The museum website gives hours and other details. They’re doing a neon bus cruise on Valentine’s Day if you want an especially offbeat, if bright, outing. 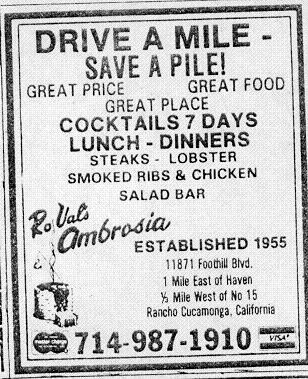 RoVal’s was a steakhouse in what’s now Rancho Cucamonga from the ’50s through the ’70s. The co-proprietor, RoVal Jones, died Jan. 23 at age 89, according to an obituary in the Bulletin today. She and her late husband, Jack, ran RoVal’s. Meanwhile, a new location opened in 1959 at 11871 Foothill Blvd., on the southwest corner of Rochester, across from the old stone house and winery. Thanks to Kelly Zackmann of the Ontario Library’s Model Colony History Room for much of the above, including the cool ad. The rendering up top came from the Jones family and depicts the first location. I’m going to try writing a few lines for Friday’s column, or maybe Sunday’s. In the meantime, anyone remember the place? More oddball trivia coming Wednesday from the dregs of my desktop and e-mail in-box: a silent film connection to Ontario, a novel that cites Claremont and Fontana, a celebrity sighting in Upland and a few more tidbits. Let me know if you like this sort of thing. Over the years oldtimers have mentioned the Noble Inn to me fondly. Anyone else recall it? I love the rooftop sign. 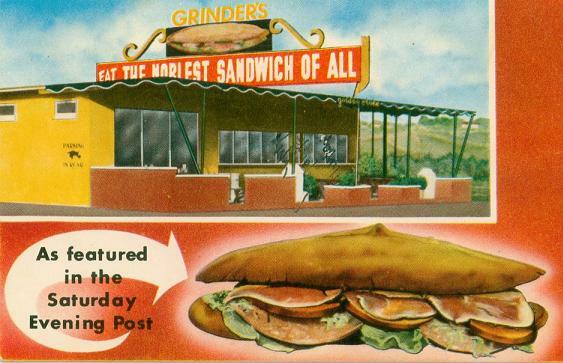 * Joe Mannella also contributed the postcard image, which I added in August 2012. Separately, readers Archie Baril and Marilyn Varney sent me a link to this very funny Spike Feresten video clip on the confusing directions for obtaining and connecting a digital converter box. Blogging provides a nice secondary outlet for me, but ideas and material continue coming in faster than I can use them, or figure out what to do with them. Paper tends to accumulate on my desk. And every January, I tame the pile by sifting through it for still-useful info, while filing or tossing the rest. That’s what Sunday’s column consists of: anecdotes, trivia, that sort of thing. I hope you like it. Particularly since there’ll be another column just like it sometime next week, with my leftovers’ leftovers. For my dozen years at the Bulletin, I’ve noticed the aging blue Inland Business Center that has China Point as a tenant — and continued driving past. But on Wednesday I finally pulled in. China Point’s interior has a ’70s ambiance and feels almost personality-free: one wall mirrored, the other lavender, with generic booths and tables and a few small pictures and hangings for a Chinese touch. If China Point ever lost favor, a taqueria or pizza parlor could take over the dining room with about an hour’s notice. But that’s unlikely, because the restaurant has been there for years and was half full when I went in for lunch (although not half full of Asians). 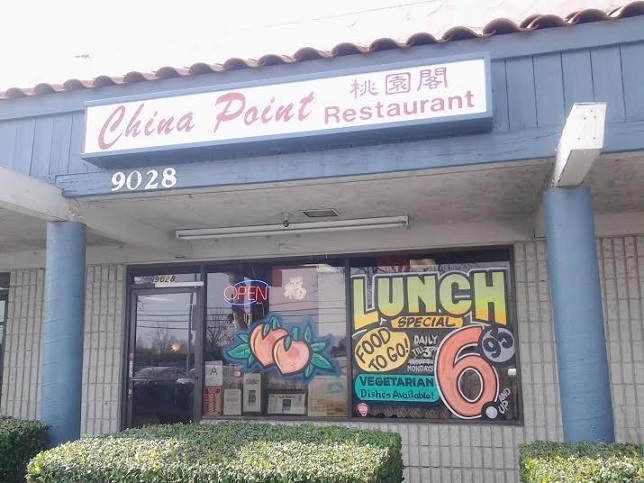 The China Point menu is separated by price points, with items listed under headings for $6.25, $6.95 and $7.95 — I didn’t see any takeout menus so I’m doing this from memory — with a daily $5.95 special. China Point is old school Americanized Chinese, with chop suey still on the menu, and when you order from one of the no-nonsense waitresses, the default rice is fried. I got No. 23, shrimp with garlic sauce ($7.95), with steamed rice, hot and sour soup, a wonton and an egg roll. Well, the food was a little better than expected: sinus-clearingly spicy and generous with the shrimp — I counted a dozen, and they were decent-sized. And there was so much food I took home half the entree. In the hierarchy of Inland Valley Chinese restaurants, China Point falls in the middle: Not truly authentic (Good Time Cafe, Peking Deli), not even moderately authentic (China Gate, Chu Chinese, Dragon Inn, etc. ), but well above steam-table outfits. Looks like I forgot to write a Wednesday column preview. Oops. Well, here’s what’s coming Friday: a report from this week’s Ontario council meeting. It was the latest in a post-election string of curious meetings, capped by an angry, oxygen-sucking speech by the mayor. I hope you all read Wednesday’s column even without a teaser like this.